Aurora Haskap produces great tasting berries. 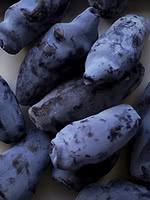 Their taste is a cross between raspberry and blueberry. The berries can be used for eating fresh, baking, jams and jellies, freezing. 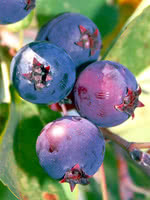 The haskap berries are high in vitamins, fibre, and anti-oxidants. Aurora is a pollinator variety that causes other varieties to have a higher yield when planted together. Borealis and Aurora have similar taste but differ in the size and shape of the fruit. Aurora is a great companion variety for the Borealis.